To be honest, I actually don't like regular marshmallows all that much but when they're toasted and all melty like this, it's a whole different story! This dip is so easy to make, fun to eat with your family (everyone gets messy) and just tastes incredible, better than regular s'mores if you ask me and we all know that's pretty wonderful already! * I used Ghirardelli 60% chips and I think 1 cup is a little more than you need so I recommend a scant cup. Place chocolate chips in a 6-inch cast iron skillet. Snip large marshmallows in half (this is a fun job for kids) and place them on top of the chocolate chips (you could also use mini marshmallows). Place skillet in the oven and bake for 7-9 minutes, until marshmallows are browned. With oven mitts, carefully remove the hot skillet from the oven and serve immediately with graham crackers for dipping. Have fun! Not exactly a fan of marshmallows, but this one looks really great with that browned top! What a clever way to make smores Monica, love it!!!! I've seen it for ages and never thought to try it until I realized recently I had extra graham crackers and there was my little 6-inch skillet. So tasty - a great treat on a cold night! I've never had smores dip. I came here to check as soon as I saw your post in the mail. This is genius! My daughter has invited some of her friends in the evening, may be she will love to make these. What an awesome weekend full of yummy food! 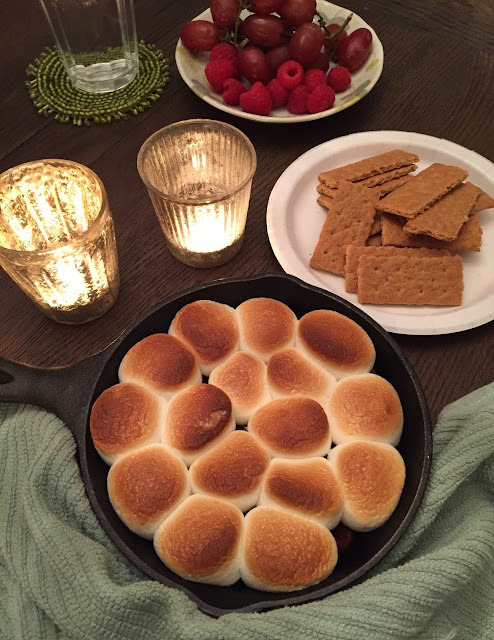 Love that you made a s'mores dip! I'm with you, there's something so irresistible about marshmallows when they're all melty and of course with chocolate always makes it fun :) Looks perfect, Monica! I remember you made s'mores dips with different chocolates (like Reese's!). I have to try that next time!! So so good...maybe too good? This one looks amazingly delicious and beautiful! It's a lot of fun and great messy food to share! This is a brilliant idea - perfect for chilly nights! I'm so glad there are so many smart creative people out there to share recipes with us. I love this! I know this is supposed to be a dip but it looks so good I'm just going to use a spoon. YUM! haha! I love that, Pamela!! I've had many s'mores dips before but I love how easy this one is! You lucky, smart lady! : ) This was so easy and I can't wait for an excuse to serve it up again. I believe you! This looks fantastic. I've seen various recipes for this around Pinterest - but I really believe you :) I may have to adapt this for a camping recipe. Thanks Monica - have a wonderful Thanksgiving! Same here and this one, no frills, totally works like a charm. This is as close as I get to actually "camping" so I'll imagine you having this outdoors. Have a great Thanksgiving! What a delicious and clever way to make smores. So pretty and delicious. My kids love smores and this look so good and easy to make! Can't wait to surprise them with this dip. It is a fabulous treat for kids! Thanks, Amy. Hello gooey s'mores dip! This is brilliant, Monica. So quick, warm and sweet. I'm so making this!